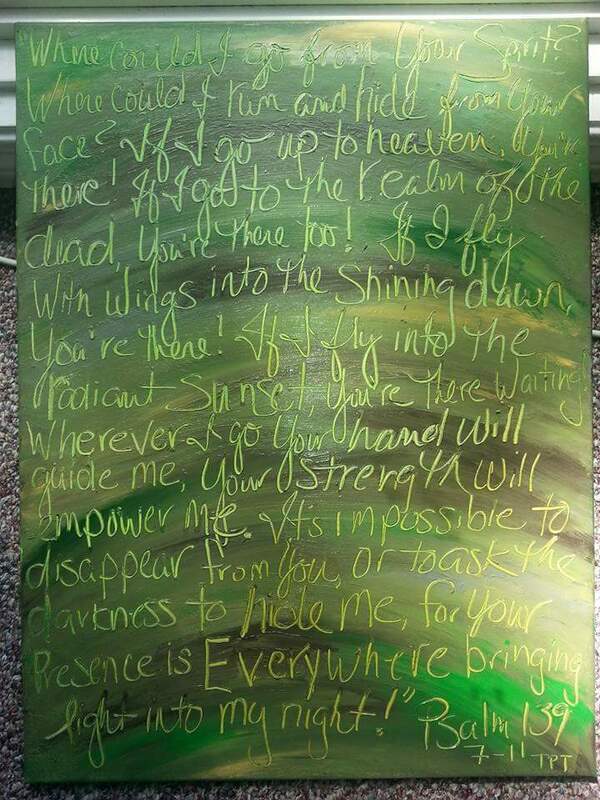 This is a painting I made for a friend, a camoflauged version of Psalm 139. Which is all about being unable to hide from God and His love for you. I liked it. She liked it. So I’m sharing it. Adam and Eve tried to hide from God in the Garden because of what they had done. We all know that we cannot hide from an all-seeing and all-knowing God. But most of us still try it. It’s silly and pointless but we do it. Shame. Fear. Guilt. Those are all tools of the darkness, the enemy, to steal your joy, hope, peace, and distract you from your purpose. Take your mistakes immediately to God, because in the light there is hope, healing and restoration. Point to ponder while you wander…​There’s no camouflage from God. He sees you, even if no one else sees you. You are not invisible nor forgotten, but engraved on the palm of His hand. Nothing can stop Him from loving you. Nothing! By Jillbeingstill in encouragement, God's love, Psalm on May 14, 2017 .